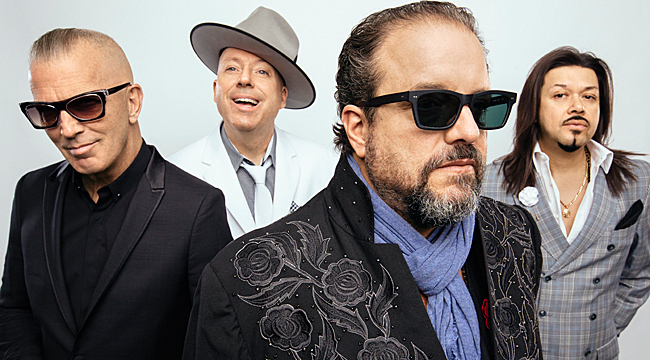 Late in our conversation with guitarist Eddie Perez, he points out that, “We’re still that bar band that played covers five nights a week,” when discussing the musical melting pot that helped to fuel the ever-expanding diverse sound that the Mavericks bring both to the stage and the music on their albums. The Miami-bred band laid down one of our favorite sets last fall at the annual Roots N Blues N BBQ festival in Columbia, Missouri. Their first appearance at the fest made such an impression that they’ll be back for a second round this year. We spoke with Perez recently and he gave us his thoughts on several topics, including the festival scene, the variety of covers that they work into their set and the story behind their fantastic new album, Brand New Day. I had the chance to see the band’s set at Roots N Blues N BBQ last fall. Festivals have become a big part of the touring cycle for bands. What does that add to your day to day dynamic of playing shows?Well, we really do seem to be able to tap into an energy, I guess you can call it, with whatever size audience we get to play for. We’ve done everything from 200- to 300-seater little venues to 80,000 people in Hyde Park in London. The festival atmosphere is always exciting because it’s always on a big stage. Most of the time it’s an open field and there’s always so many people. I think it takes a really big, great music fan to want to go and not only pay the money, but have that experience and to be out in the elements and experience that with hundreds or in some cases, thousands of other people. I think it takes a really big music fan to be compelled to do that. I’m very aware of that to. In most respects I’m still a fan at heart as well. So when we do our thing, at least the way I approach what I do with the Mavericks, I always remember that. I always kind of approach it as, what would I like to see from my favorite band? I’m always trying to tap into that perspective. But I’ve noticed that for us, the festivals and the big stage festivals always seem to be really special. I think it’s because the people there are there specifically for the music and to be entertained. The specialness in the festivals is something that we always look forward to, regardless of the weather. Sometimes we’ve played festivals and it’s just been pouring rain and people are still hanging out there for it. That creates a whole other energy entirely. The band was working on this latest album in between touring. How did being on the road mix into the creative process? I feel that it mixed in quite well. We’ve been pretty busy the last few years touring. We’ve averaged about 120 shows a year. So that does something for a band that plays together that much. When we have those moments and the break in the action between the touring dates—and then spending time at home too, I mean, we also have to try to work that into it as well—we’re always trying to find a block or a space of time where we can go in and try to harness some of this creative energy that we seem to have. I think it all spawns itself. It starts with the shows and the energy from the audiences and the venues and also too, the traveling all of the time. You’re always in motion and you’re always thinking about it, so it’s kind of like a big creative wheel that happens. Over the last couple of years, we’ve actually been able to map out a few different breaks in the action in terms of the touring schedule, so that we could pop into a studio and try to see if we’ve got something worth recording. The Brand New Day record really started with that process in mind. We didn’t really have a whole bunch of material, but we knew that we wanted to make the best use of our time and we wanted to plant some seeds for the future. We threw ourselves into it whenever we had a break in the action. Part of the record was recorded at the very famous Capitol Studios in Hollywood where Nat King Cole, Frank Sinatra, the Beach Boys and all of those cats recorded all of those years ago. So it was a very inspired affair. That took a couple of days and that’s really what got the ball rolling. And then we kept doing the same thing. We kept trying to see where it would make sense for us to be able to get into a studio and to try to take another swing at it. Before we knew it, we had amassed a record. Then we just started honing it in. But really, it was done because of the way the schedule was. It was the only way we could do it. We were so busy all of last year and toured extensively. Europe, Canada, the States, I mean, back and forth every which way! So we were quite busy and I think it’s quite a feat that we found a way to put it all together. And especially, being our own label now [Mono Mundo], we were not just doing the music, we were also doing the artwork and doing everything. For a bunch of guys that have been at it a real long time, I feel like we made a really great effort at it. You mentioned Capitol, it must have been very cool for you guys as music fans to work in those hallowed walls. Oh, it was beyond cool, I’ve got to tell you. All of us in the Mavericks, we’re all really big audiophiles. We all are record collectors and we’ve been doing that since our teen years. The historic content of what that building stands for is completely not lost on us. In fact, I feel in large part for our time that we were there, I feel like we really channeled a lot of that great legendary stuff that was there in terms of spirit and energy. It really is what kicked off this new record. That’s how we kind of started it. It was pretty amazing, the energy there and the sounds and the equipment and just being there was pretty spectacular and we all felt the specialness of it. There are a few tracks on this Brand New Day record that really show that part of it too. Let’s talk about working on the title track. I know that Raul [Malo] has always been chasing a song that he felt would measure up to Elvis Presley’s “It’s Now or Never.” What struck me listening to the title track was that it just has the sound of that certain time and things like the Phil Spector “Wall of Sound” feel or the epic sound that you would hear on some of the Righteous Brothers’ material. It sounds so big. It’s not surprising to hear you call the band members “audiophiles” because that really comes through listening to a song like “Brand New Day.” Here’s a song that was made by guys that have listened to and have a lot of appreciation for those records. We certainly do. I think what was going on the whole process of that session was this. Whenever we come into the studio to start our day everybody always brings a stack of records. We go into the studio and we get our coffee and we sit around the console. While our brilliant engineer and co-producer Niko Bolas is getting sounds and whatnot, we’re thinking about energy. We’re talking about what turned us on and it’s always a great time because it just seems to really fuel what comes next. I was chuckling a little bit to myself, because on that particular day, we were listening to all of that Phil Spector stuff on the big studio speakers and just thinking and imagining what it must have been like to be in that time and recording those things. As we started getting into that track and recording it, it started becoming obvious how much we were vibing on all of that stuff. Yeah, you were right too about your comments, by the way. All of us, we really are students of all of that stuff. I mean, that’s kind of the world that we live in, in terms of our inspiration. With those things, you try to take the stuff that turns you on about that particular era and then you try to throw yourself into it and I feel like we were pretty successful. I feel like that track in particular has that bigness. It has that “Wall of Sound” epic production. The thing that I’m most proud about all of that is that that’s entirely us. We play lots of different instruments, all of us. Paul Deakin was on the big mallets with the church bells and the tympani and then the vibraphones. I mean, it was pretty massive, to think about it now! But you know, we’re such big fans of the Wrecking Crew and all of those guys . . . and lady, I should say. We can’t forget about Carol Kaye in all of that! But what a sound they created and what an era it defined. That is certainly a tip of the hat to that stuff that we love so much. Yeah, you listen to that song and it’s clear that you guys didn’t fly any of that stuff in. It’s all real. No, it’s all real and it’s all played. You know, the way we go about most of it is we all set up in the studio at the same time. It’s like a live band playing. We have the fortune of being in one of the best places in the world for studios and equipment, so that’s a big part of it too. And also, the people that are playing the music, again, everybody has that same sort of vocabulary, so to speak. So when it comes together and we identify it, it really turns into something special. Not only with that track, but there’s many tracks on this record that have their own special thing to them. I don’t think I have one favorite, quite honestly. You guys have covered Pink Floyd’s “Us and Them” live. How did that develop? I think that’s kind of a cool one that really shows off the versatility of this band. Thank you so much. You know, that just evolved out of soundchecks. Whenever we do soundchecks, we have been known to work up something and just throw it into the set for that night and then we never play it again. I think that’s one of the biggest things and it’s also showing our influences. It’s also showing the range of what this band can do together. I think it’s a special thing to showcase, because you know, there’s not a lot of bands out there that can do that sort of thing, I think. You know, do their own music in their own particular style and then on a dime, turn into something, whether it’s Neil Diamond or Engelbert Humperdinck or Pink Floyd, for that matter. But most of all, what’s at the heart of all of it is just good playful fun. We hope that people respond to it favorably, but it’s just a lot of fun. At heart, I will tell you that it’s just a bunch of guys who grew up together, knowing how to play music from being in the garage with all of their friends. We’re still that bar band that played covers five nights a week. It’s really quite an investment of time over the last many years. But yeah, it just came out organically. We just started messing with it one day in a soundcheck and before we knew it, we were full-blown putting it into the set list. It was nice to get the chance to record some of that stuff. The band has a history of inspired cover choices. Obviously, the cover of Bruce Springsteen’s “All That Heaven Will Allow” has become a staple. But you know, you listen to your version of Neil Young’s “Harvest Moon” and the way that you guys do that, it sounds like it could be a lost Mavericks classic. It’s always interesting to hear the stuff that you guys pull out. Raul is the spearhead of all of this creative stuff. The way we work, it usually starts with him. I mean, first of all, you have that beautiful, lush voice. That rock and roll, operatic, beautiful toned voice. So that certainly gives you a wide range of music to pull from when you have a singer that has that ability. And then on top of that, you’ve got a bunch of musicians who are well-versed in American music, let’s say, in general, from ‘30s jazz to ‘70s rock and roll to soul music, Motown and everything else in between. When it comes together in that playful way, it’s a lot of fun. In fact, I think we were talking just the other day, about finding some more cover tunes and opening it up to see how far we can take that. But Raul is a really good barometer of that. He has to feel what he is doing. You know, especially the way he does what he does. He throws himself into it entirely. It has to feel genuine to him, first and foremost, to be able to put that across in the manner and fashion that he feels is, let’s face it, good enough for him to put it out there. We all feel that way. But we’ve got some more inspired choices coming that might give people some [surprise], like, “Wow, they can do that too?” So we’re looking forward to the rest of this touring season, quite honestly. After the break in the early 2000s, it really seems like you guys have found a good groove here in the next chapter of the band. You’re working a lot and it all seems to be positive. I can tell you that we’ve worked really hard on it. Not just the music and the touring, but on each other, on this business, as people, trying to remain friends and also business partners. You know, it’s quite a balance, but I feel in most part, we’ve been able to do that. But I think, more than anything, I can just attribute that to maybe just some maturity. Well, I guess, depending on who you ask, right? But in my opinion . . .
You feel like you’ve grown! I feel like we’ve all grown, yeah! You know, we’ve all done lots of things. We’ve had more kids and have moved houses and all of that stuff in between. That does a lot to you. I’m just at the moment in my life where I’m recognizing the significance of this moment. Regardless of what’s going on outside of my own bubble, I have to realize where I’m at in my life . . . this is the best part of my life. That’s a good thing to realize and take stock of. Well, I feel that right now, that’s the only way to go that makes the most sense to me. Because what I see in the outside world is so sad and it’s so tumultuous and it’s senseless, quite honestly. I’m on the side of humanity and you know, when I look around, it makes me sad. But you know, I’m also hopeful too, because I meet a lot of young kids that are inspired to follow what we do and they look to us for a certain guidance. So I’m in a bit of a special position to be in and I try to put as much positive moving energy as I can forward, regardless of what’s going on around me. Somehow, I’ve been very blessed with the opportunity to do that, so I’ll keep on trucking! You guys have the chance to brighten people’s day with the music, which is powerful and much needed right now. Yeah, I think so too. You know, you’re always going to need balance in these times. When there were tumultuous times in the late ‘60s, the poets and the activists and the people that were fighting for what was sensible and humane. They seemed to have a very powerful strong voice, so I think that right now, the world does need that stuff. Now more than ever, right now. Matt Wardlaw's enthusiasm for music seems to know no bounds. In addition to Whopperjaw, you may have seen his name pop up in the Riverfront Times, Popdose, Cleveland Scene, Ultimate Classic Rock, Blogcritics and other entertainment-focused pubs. And yet he still has time for his own Addicted to Vinyl site, where he blogs about music he loves and things that he hates because, as Matt says, he's "equal opportunity like that."